Hailed by Larry McMurtry as “One of our finest writers,” Francine Prose is the author of numerous novels. 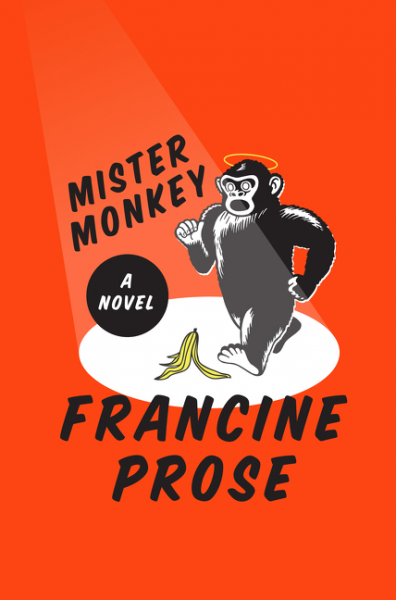 Her most recent, Mister Monkey (2016), was praised by the New York Times Book Review as: “so fresh and new it’s almost giddy, almost impudent with originality.” And: “Tender and artful, Prose’s 15th novel is a sophisticated satire, a gently spiritual celebration of life, a dark and thoroughly grim depiction of despair, a screwball comedy, a screwball tragedy….It’s gorgeous and bright and fun and multi-faceted, carrying within it the geological force of the ages. It’s a book to be treasured. It’s that good. It’s that funny. It’s that sad. It’s that deceptive and deep.” Her other novels include Lovers at the Chameleon Club, Paris 1932 (2014), a NY Times Notable Book of 2014 and one of NPR’s Best Books of 2014; My New American Life (2011), a “satirical immigrant story that subtly embodies the cultural complexity and political horrors of the Balkans and Bush-Cheney America (Donna Seaman)”; Goldengrove (2008), a profoundly moving novel about a young girl plunged into adult grief and obsession after the drowning death of her sister; A Changed Man (2005), for which she won the first Dayton Literary Peace Prize in fiction; and Blue Angel (2000), a finalist for the 2000 National Book Award which was recreated in the film adaptation Submission in 2018. Prose’s nonfiction books include, Peggy Guggenheim: The Shock of the Modern (Yale University Press, 2015); Anne Frank: The Book, The Life, The Afterlife (HarperCollins, 2009); Reading Like A Writer (2006), a New York Times bestseller; The Lives of the Muses: Nine Women & the Artists They Inspired, a national bestseller; Caravaggio: Painter of Miracles, a biography of the painter for the Eminent Lives series; Sicilian Odyssey, a travel book; and; Gluttony, a meditation on a deadly sin. Her award-winning young adult novels include Bullyville and After. She is also the author of Hunters and Gatherers; Bigfoot Dreams and Primitive People; two story collections; and a collection of novellas, Guided Tours of Hell. Prose has also written four children’s books and co-translated three volumes of fiction. Her stories, reviews, and essays have appeared in The Atlantic Monthly, Harper’s, Best American Short Stories, The New Yorker, The New York Times, The New York Observer, Art News, The Yale Review, The New Republic, and numerous other publications. A fellow of the New York Institute for the Humanities and a 1999 Director’s Fellow of the New York Public Library’s Center for Scholars and Writers, Prose is a contributing editor of Harper’s Magazine, for which she has written such controversial essays as “Scent of A Woman’s Ink” and “I Know Why the Caged Bird Can’t Read.” She is a frequent contributor to the New York Review of Books and a Distinguished Visiting Writer at Bard. In 2010, Prose was awarded the prestigious Washington University International Humanities Medal. Awarded biennially, the medal honors the lifetime work of a noted scholar, writer, or artist who has made a significant and sustained contribution to the world of letters or the arts. She has also been the recipient of a Guggenheim Fellowship, a 1989 Fulbright fellowship to the former Yugoslavia, two NEA grants, and a PEN translation prize. Prose has taught at Harvard, Sarah Lawrence, the Iowa Writers’ Workshop, The University of Arizona, The University of Utah, the Bread Loaf and Sewanee Writers Conferences. She currently teaches at Bard College. A film of her novel, Household Saints, was released in 1993. In 2009, Prose was elected into the Academy of Arts & Letters. She lives in New York City. Francine Prose is the author of numerous novels, including Lovers at the Chameleon Club, Paris 1932; My New American Life; Goldengrove; A Changed Man; and Blue Angel. Prose’s nonfiction books include Anne Frank: The Book, The Life, The Afterlife; Reading Like A Writer, a New York Times bestseller; The Lives of the Muses: Nine Women & the Artists They Inspired; Caravaggio: Painter of Miracles; Sicilian Odyssey, a travel book; and; Gluttony. Her stories, reviews, and essays have appeared in The Atlantic Monthly, Harper’s, Best American Short Stories, The New Yorker, The New York Times, The New York Observer, Art News, The Yale Review, The New Republic, and numerous other publications. The acclaimed New York Times bestselling author weaves an ingenious, darkly humorous, and brilliantly observant story that follows the exploits and intrigue of a constellation of characters affiliated with an off-off-off-off Broadway children’s musical. Mister Monkey—a screwball children’s musical about a playfully larcenous pet chimpanzee—is the kind of family favorite that survives far past its prime. Margot, who plays the chimp’s lawyer, knows the production is dreadful and bemoans the failure of her acting career. She’s settled into the drudgery of playing a humiliating part—until the day she receives a mysterious letter from an anonymous admirer . . . and later, in the middle of a performance, has a shocking encounter with Adam, the twelve-year-old who plays the title role. A richly imagined and stunningly inventive literary masterpiece of love, art, and betrayal, exploring the genesis of evil, the unforeseen consequences of love, and the ultimate unreliability of storytelling itself. Paris in the 1920s shimmers with excitement, dissipation, and freedom. It is a place of intoxicating ambition, passion, art, and discontent, where louche jazz venues like the Chameleon Club draw expats, artists, libertines, and parvenus looking to indulge their true selves. It is at the Chameleon where the striking Lou Villars, an extraordinary athlete and scandalous cross-dressing lesbian, finds refuge among the club’s loyal denizens, including the rising Hungarian photographer Gabor Tsenyi, the socialite and art patron Baroness Lily de Rossignol; and the caustic American writer Lionel Maine. As the years pass, their fortunes—and the world itself—evolve. Lou falls desperately in love and finds success as a race car driver. Gabor builds his reputation with startlingly vivid and imaginative photographs, including a haunting portrait of Lou and her lover, which will resonate through all their lives. As the exuberant twenties give way to darker times, Lou experiences another metamorphosis—sparked by tumultuous events—that will warp her earnest desire for love and approval into something far more. “What is it about Anne Frank and her novel-like diary that has given this deceptively simple work such a long and spectacular afterlife? Why and how, against all odds, did a young girl’s chatty, innocent, prodigiously well-crafted book become an integral part of our culture, our history, our souls, and our civilization?” These are the questions that Francine Prose answers in Anne Frank: The Book, The Life, The Afterlife, her powerful exploration of the life of Anne Frank and the phenomenon that is The Diary of Anne Frank. The book will appeal to, and reach, the widest possible audience—general readers, teachers, and students, those of us who grew up with the diary, who want to find out more about it, and perhaps come to understand it in a deeper and different way. Distinguished novelist and critic Francine Prose inspires readers and writers alike with this inside look at how the professionals read and write. Long before there were creative writing workshops and degrees, how did aspiring writers learn to write? By reading the work of their predecessors and contemporaries, says Francine Prose. In Reading Like A Writer, Prose invites you to sit by her side and take a guided tour of the tools and the tricks of the masters. She reads the work of the very best writers—Dostoyevsky, Flaubert, Kafka, Austen, Dickens, Woolf, Chekhov—and discovers why these writers endure. She takes pleasure in the long and magnificent sentences of Philip Roth and the breath-taking paragraphs of Isaac Babel; she is deeply moved by the brilliant characterization in George Eliot’s Middlemarch. She looks to John Le Carré for a lesson in how to advance plot through dialogue, to Flannery O’Connor for the cunning use of the telling detail, and to James Joyce and Katherine Mansfield who offer clever examples of how to employ gesture to create character. She cautions readers to slow down and pay attention to words, the raw material out of which literature is crafted. Written with passion, humor, and wisdom, Reading Like A Writer will inspire readers to return to literature with a fresh eye and an eager heart. Lula was twenty-six. Old, she thought on dark days. Only twenty-six on bright ones. She had time, but she had more time if she stayed in this country. She wanted to learn that American trick, staying young till forty. Some American girls even got better looking. Not like Eastern Europeans, who started off ahead but fell off a cliff and scrambled back up a grandma. Maybe the pressure to marry aged them before their time. But their was no pressure on Lula. If her ancestors wanted grandchildren, they were keeping quiet about it. Reading Anne’s diary, we become the friend, the most intelligent, comprehending companion that anyone could hope to find. Chatty, humorous, familiar, Anne is writing to us, speaking from the heart to the ideal confidante, and we rise to the challenge and become that ideal confidante. She turns us into the consummate listener, picking up the signals she hopes she is transmitting into the fresh air beyond the prison of the attic. If her diary is a message in a bottle, we are the ones who find it, glittering on the beach. Within a few pages, the transparency of Anne’s prose style has convinced us that she is telling the truth as she describes the world around her and looks inward, as if her private self is a foreign country whose geography and customs she is struggling to understand so that she can live there. Among the motifs that run throughout the book is Anne’s urgent desire to find out who—what sort of person—she is. Can creative writing be taught? It’s a reasonable question, but no matter how often I’ve been asked, I never know quite what to say. Because if what people mean is: Can the love of language be taught? Can a gift for storytelling be taught? then the answer is: No. Which may be why the question is so often asked in a skeptical tone implying that, unlike the multiplication tables or the principles of auto mechanics, creativity can’t be transmitted from teacher to student. Imagine Milton enrolling in a graduate program for help with Paradise Lost, or Kafka enduring the seminar in which his classmates inform him that, frankly, they just don’t believe the part about the guy waking up one morning to find he’s a giant bug. He was thirty-nine when he died, in the summer of 1610. He had been in exile, on the run for the last four years of his life. He slept fully clothed, with his dagger by his side. He believed his enemies were closing in on him and that they intended to kill him. He was wanted for murder in Rome, for stabbing a man in a duel that was said to have begun over a bet on a tennis game. It was not the first time that he had been in trouble with the law. He had been sued for libel, arrested for carrying a weapon without a license, prosecuted for tossing a plate of artichokes in a waiter’s face, jailed repeatedly. He was accused of throwing stones at the police, insulting two women, harassing a former landlady, and wounding a prison guard. His contemporaries described him as mercurial, hot-tempered, violent. Michelangelo Merisi, known as Caravaggio, was among the most celebrated, sought after, and highly paid painters in Rome.